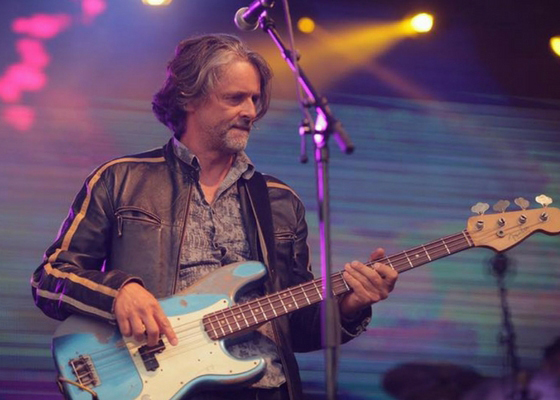 Phil started his own musical career as a freelance bass player in Brighton and he got his first big break being asked to join Kim Wilde on her 1992 World Tour. Shortly after Phil was one of the founding members of ‘World On Fire’ who were signed to MCA Records. An album of their previously un-released tracks is due out in May 2017. Phil was subsequently on the books of ‘Session Connection’, an agency specialising in matching quality musicians to big acts of the day. This led to numerous TV performances, primarily on Top of The Pops (‘You arrived at stupid-o’clock, stayed for hours and the pay was shocking!’) in the 90s and early 2000s. He also spent the best part of four years touring with Keith Emerson, of Emerson, Lake and Palmer fame. He also writes and performs with his own group, the gloriously-monikered ‘Faint Signs of Intelligence’, and collaborates with numerous other artists. Phil and his young family moved to Harlow in 2003 after many years in Kent and Sussex. In between touring he teaches both bass and guitar from his home in Old Harlow, where he also has a small recording studio. If you are interested in recording tracks yourself, or having guitar and bass lessons, why not give Phil a call on 07850 438906. We promise it won’t be boring! LIKE Phil Williams Bass and Guitar Tuition Facebook page.